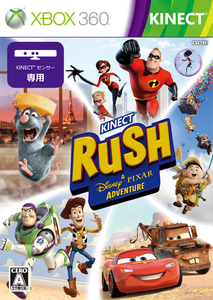 コピーライト表記：(C) Disney / Pixar. (C) 2012 Microsoft Corporation. All rights reserved. Developed by Asobo Studio S.a.r.l for Microsoft Corporation. Microsoft, Kinect, Xbox, Xbox 360, Xbox LIVE and the Xbox logos are trademarks of the Microsoft group of companies. Asobo Studio S.a.r.l is a registered trademark. Technology (C) 2012 Asobo Studio S.a.r.l. All rights reserved.